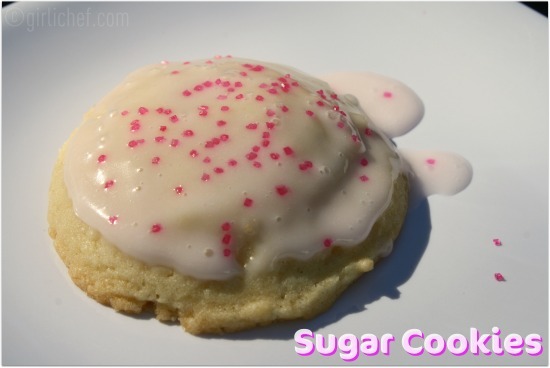 Eggland's Best Pink Party ...raising awareness for breast cancer + a GIVEAWAY! Did you know that this month marks the 26th anniversary of National Breast Cancer Awareness month? Other than skin cancer, breast cancer is the most common cancer among women in the United States and the second leading cause of cancer death in women, after lung cancer. * One of the best defenses against breast cancer is leading a healthy lifestyle. We can't change our genes, but we can look good in the ones we have. Research suggests that exercising 35 minutes per day may help reduce the risk of certain cancers, breast cancer included. 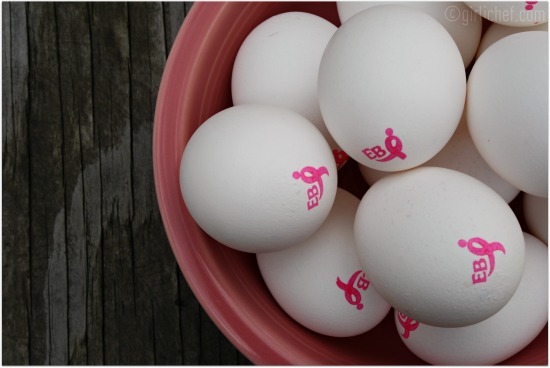 For the second year , in an effort to help promote Breast Cancer Awareness, Eggland's Best will be pledging a donation of $50,000 to Susan G. Komen for the Cure®. 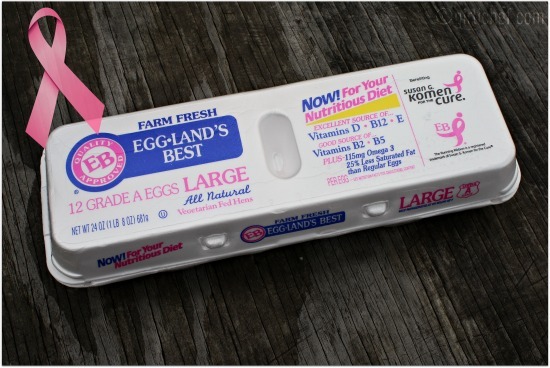 You may notice that starting in mid-September and stretching through mid-November, Eggland's Best switches out their famous "red EB in a circle" stamp for a pink Komen for the Cure® stamp (look for the cartons with the pink print!). Susan G. Komen for the Cure® is the largest breast cancer organization in the United States. It has invested nearly $2 billion towards breast cancer research, education, advocacy, health services and social support programs in the US since its inception in 1982. With the help of companies like Eggland's Best, they have also been able to invest another $75 million in research over the past year, as well as providing more than 600,000 women with free screenings and over 100,000 with treatment assistance. * So, when Eggland's Best asked me if I'd like to hold a PINK PARTY to help promote awareness...I eagerly responded in the affirmative. After two foiled attempts at a PINK HOUSE-WARMING BRUNCH (grrrrr), I wound up throwing a PINK PARTY for the kids of a group of people (+ my little ones) at a local community center. 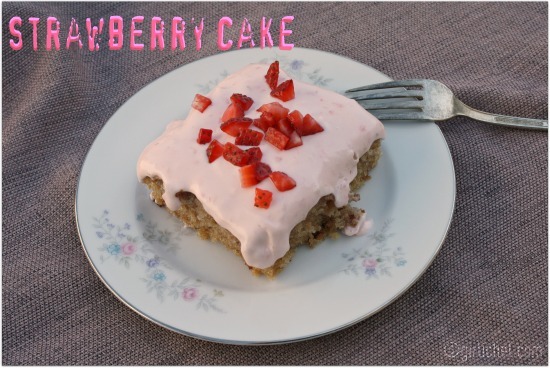 While the meal was already planned, I snuck off with the kids after everybody was nourished and let them go crazy studiously decorate desserts in pink icing, strawberry cream cheese frosting, and pink (amongst other colors) sprinkles! 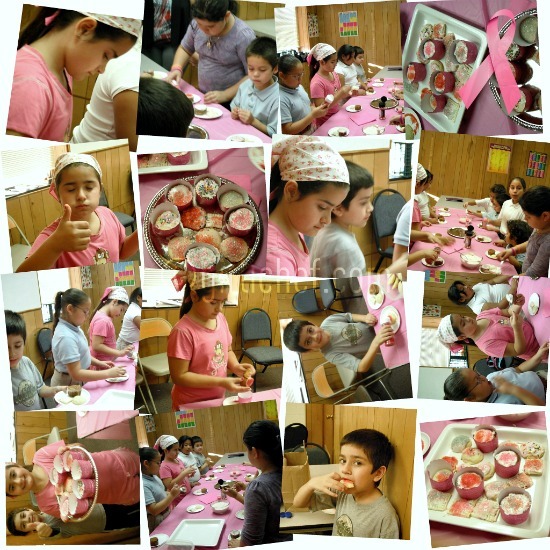 Almost all of the kids knew that October was Breast Cancer Awareness month since they were learning about it at school, so while we decorated, we talked about eating healthy (yes, I see the irony) and getting enough exercise and what we could do to help raise awareness about breast cancer. We had a blast, and when we were finished, the kids proudly carried the plates of PINK DESSERTS in to the room where the adults were "in session". They shared a little bit about what they learned and why everything was pink...and talked about breast cancer awareness and research with the adults before handing them each a coupon for a dozen free eggs from Eggland's Best. We ate a ham dinner previous to decorating desserts. PINK! 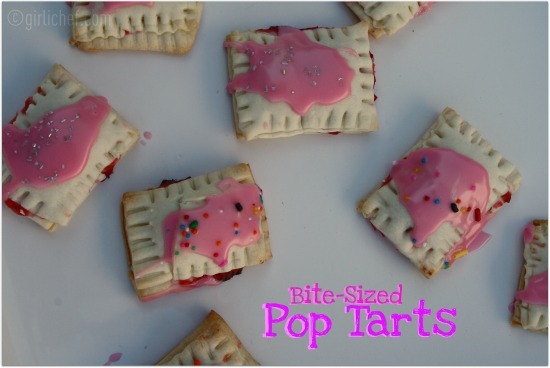 The things we made pretty in pink were bite-sized pop tarts, fresh strawberry cake and cupcakes, and sugar cookies. How to win: Simply leave an inspiring comment on this post or let me know how you contribute to raising awareness or funding for breast cancer. I will pick one comment at random to win this prize pack which is provided and sent to the winner by Eggland's Best. Submissions due by 11:59 pm (Eastern) on Friday, October 14, 2011. Good Luck! *Update 10/15/11: congrats to Amy at UTryIt! And thanks to everybody who entered and supports breast cancer research and awareness. 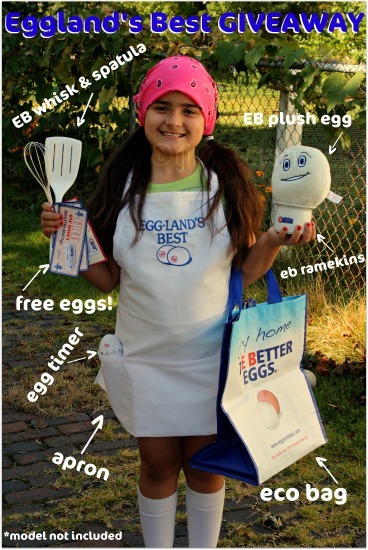 *As a participant and host in the Eggland's Best Double Dozen, I received a "Pink Box" that contained coupons for free EB eggs, plus my own set of the giveaway items to try: ramekins, apron, whisk, spatula, egg timer, eco bag, and a plush toy. They also made a donation in my name to the Susan G. Komen for the Cure® foundation and gave me a gift card to help cover the costs of the party. Eggland's Best is providing the winner of this giveaway with their prize. All opinions stated in this post reflect my own personal opinions and experiences: they are 100% my own. What a fabulous party you created! I support the cause through direct donations as well as through the purchase of products whose companies donate to the Komen foundation. Aww how super crazy fun! i really need to get rolling on planning my party! Every year I donate to the Breast Cancer Research Foundation, and I encourage my friends to do the same. What a meaningful and cute giveaway package. What a fun way to raise awareness for breast cancer. I read a great book written by Susan Komen's sister about how Race for the Cure was started. Unfortunately we currently have a friend with two small sisters who has been diagnosed with brain cancer. I knit and crochet caps for chemo patients. Great job ~ you all did an amazing job with your party. I love to see all the kids involved. I work with kids at church and want them to see there are so many ways they can get involved and make a difference! I try to buy participating pink products and donate to support cancer awareness. I donate money to support cancer awareness and I purchase many pink items from the grocery store. I would love to get involved in crocheting the hats -I'm going to look that up. I purchase a lot of pink for the cure kitchen items- such as whisks, measuring cups, etc. I believe they are produced by kitchenaid. Since my Grandmother and Aunt both had Breast Cancer, I do everything I can to promote awareness. I always wear a pink ribbon pin, when anyone asks me about it, I just give them one of their own if they promise to wear it. I also go to rallys and fundraising events. I can't tell you how thankful I am that there is so much research, that helped my family members survive. There are never enough dates that I can offer myself to promote and raise money and awareness to this deadly disease. If just one of volunteers stop it could mean a life somewhere and I cannot sleep at night thinking I didn't help. It looks like everyone had a wonderful time. I could go for a few of those cookies right now! I just threw my pink brunch party yesterday. What a terrific opportunity to spread the word! Great post!